By default, your site’s assessments are organized by Standard categories. The standard categories are assignments, tests, discussions, offline items and extra credit. Etudes recognizes what category each of your assessment belongs in and places it in the right category. To move an item into a different category, you can drag and drop it in its new location (see Gradebook Overview). To change the default category type, click on Edit to the right default, under Categories. Select your option and click on Done. This option allows you to set the weight percentages and the weight distribution of the items within each default category in your site. This is optional. 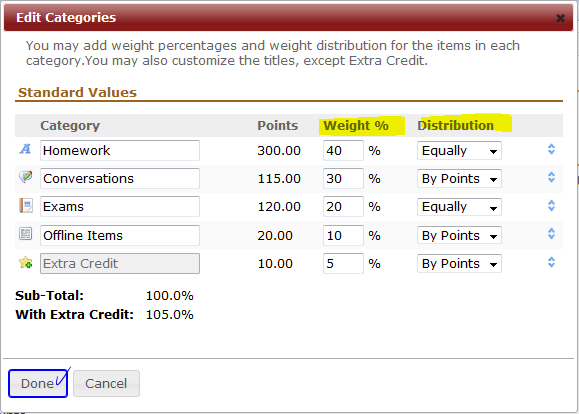 If no weights are added, the point values of your assessments will be used to calculate student grades. Click on Edit to the right of Standard Categories, under Categories, to make adjustments to the default values of Standard categories. Change the order of the categories by using the drag and drop arrows under Edit categories. This affects the order in which the categories (with their assessments) are listed in your gradebook’s Overview page. Your students’ view will be organized based on this order. Set weight percentages and weight distribution of the items within each category. This is optional. For the distribution of weights, you may choose “By Points” (default) or “Equally.” You cannot choose ‘equally’ for distribution if you are grading by points. The point values of your assessments will be used to calculate your students’ grades. “Equally” becomes an option only if grading is based on weighted averages. 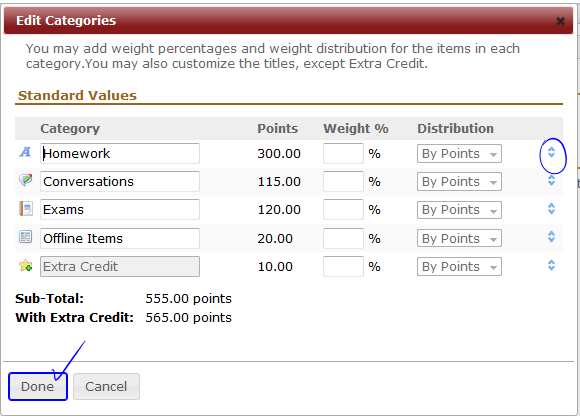 If no weights are added, the point values of your assessments will be used to calculate student grades. This is the default setting. You cannot delete categories under the Standard categories setting. If you don’t have assessments under a specific default category, it will not be listed to students. This option allows you to customize the names of the site’s categories. Optionally, you may set weight percentages and weight distribution in each category. If no weights are added, the assessment point values will be used to calculate student grades. To change your categories to Custom, click on the Edit link to the right of Default type under Categories. The default categories under Custom are the types recognized by Etudes: Assignments, Tests, Offline Items, Discussions and Extra Credit. Change the titles of the categories. Set weight percentages for each category. 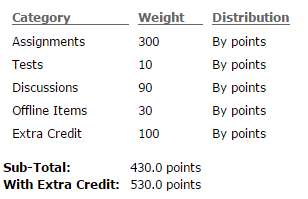 If no weights are entered, Etudes will use the point values of your assessments to calculate student grades (default). The total of the weight across your categories may not exceed 100%. Additional weight can be set in Extra Credit. Specify the distribution of the weight amongst the assessments per category: by points (default) or equally. Add additional categories (i.e. Labs, Projects, etc. ), by clicking on the Add button above the category list. Delete categories that you don’t need. Deletions are allowed only if a category is empty – that is, no assessments are underneath it. 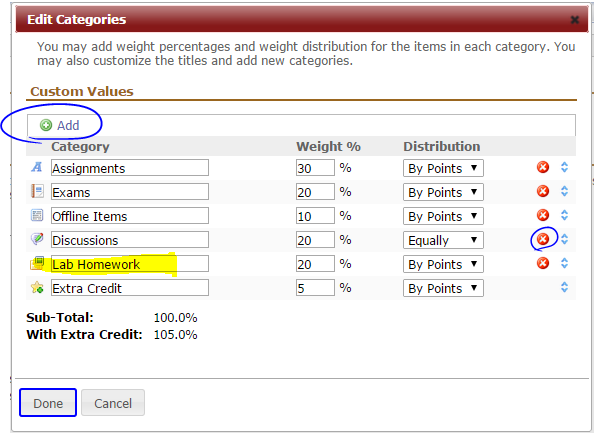 You cannot delete the Extra Credit category as the functionality needs to remain there for when it’s needed. If you don’t use Extra Credit in your course, not to worry. It will not appear in your students’ list. Any categories that have no assessments under them are not listed in the student view.